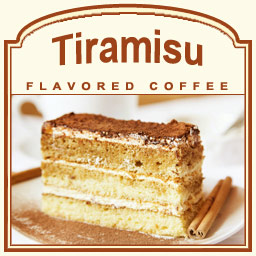 Tiramisu flavored coffee is the best flavored coffee pick-me-up. With a taste that will envelope you with its warm vanilla and rich dark chocolate flavors, this Tiramisu flavored coffee has a variety of undertones including amaretto, rum, and sherry. If you love this classic Italian dessert, you will love this dessert-inspired flavored coffee with its 100% Arabica beans that have melt-in-your-mouth flavor. The Tiramisu flavored coffee only has 2 calories per cup, but the bold taste resonates making your taste buds crave more and more. A heat-sealed valve bag will ensure the freshest coffee possible � which is why FlavoredCoffee.com roasts and ships each bag on the same day. With a full flavor from the chocolate, vanilla, and amaretto undertones, your taste buds will bask in the sweetness of this Tiramisu flavored coffee. Perfect as a dinner-dessert or even as an early morning treat, this Italian pick-me-up will be a great addition in any coffee pot.